Beyond unique ORIGINAL fashion MUST HAVE! You might one of the very first to feel the magic. The hippest Mama or Papa to proudly adorn your son or daughter with their very own badge of fashionista independence. 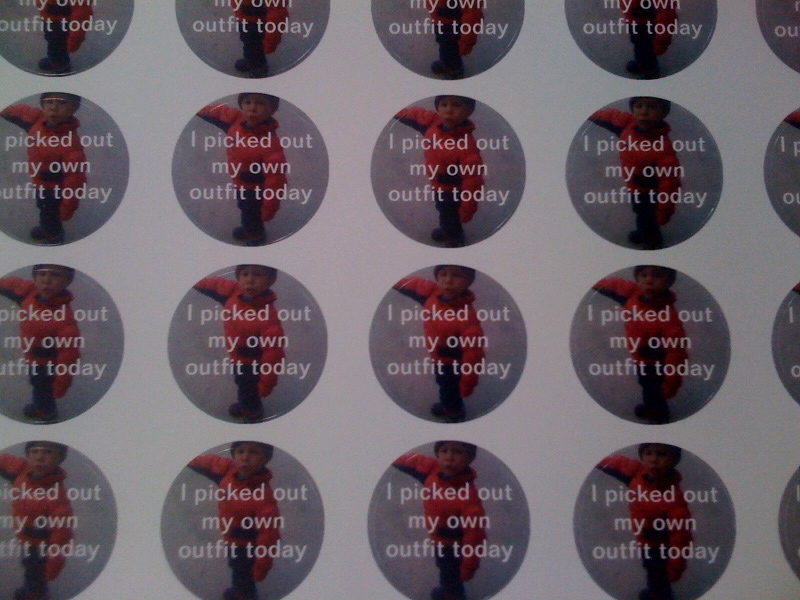 Imagine the satisfaction of peeling back one of these unique, Mama C designed, Marcel in a Spiderman suit stickers announcing that the outfit they are wearing HAD NOTHING TO DO WITH YOU! I ordered a limited number of these stickers (50 sheets of 20) to creatively fundraise our trip to meet Sam’s first family on the West Coast this August. If they run out, I’ll run a second edition with a NEW picture. I have them in my hands. I could ship a sheet out to you today! Why limit it to your children? Perhaps the wife or husband needs to share a little pride in her fashion choices today? Did your partner make a very unique choice of shirt and shoes to wear to the dinner party? Give ’em a sticker! Actual size is about an 1 1/2 inches. Click here or over at the DONATE link on the right and order away! Order often! THANK YOU. Not only do you get a sheet of twenty stickers, but you get the satisfaction of knowing you are bringing Sammy and his first mom (along with me and Marcel) together for a few days this summer. You will get to read all about it here, and know that you helped to make it happen! You are supporting both our families in not letting economic boundaries deter our deepening relationship. How cool is that? 1 sheet for $10.00, or 2 sheets for $15.00. Any additional donation happily accepted! Thank you for supporting our giant leap into the unknown (our first trip since Sam was eight months old) to connect with her, and her children and parents. The first ten orders get a free sheet included! Please make sure to include the mailing address when prompted to do so. (Maine residents please add an additional .50c per sheet). The idea for the sticker came when I was dropping Marcel off at school in one of his rain boot, Sammy shorts, inside out shirt, two color soccer sock, and Mardi Gras beaded outfits. I said to another mom; “All he needs now is a sticker announcing that he picked this outfit out by himself..” Her immediate response? “I could use a sheet of those too.” And thus a brilliant idea was born! Update: I have received/mailed off nine sheets! Only 40 left! Get them while they’re hot. Thank you for the sweet and quick response out there. Looks like buttons might be next. Catherine, please save us a sheet and will pick it up in person. Count us in for the fundraiser. We’re so thrilled about the trip. They are flying out the door!!! (OK I had my first real love order for three, just before your comment..which is something) Can’t wait to deliver your sheet in PERSON. Great stickers, Mama C! I got mine in the mail just the other day, and I think I might sport one at work tomorrow!